I fried them in a Le Crueset cast iron frypan. As is usual when making pancakes, the first few were duds, and resulted in them breaking up and me scraping bits off the pan... but the rest were fine, and didn't need much oil at all. 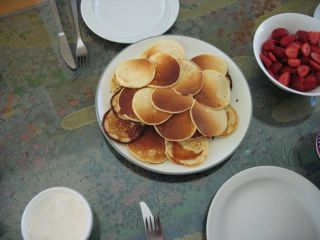 Nigella says she likes them served with just strawberries, whilst her children like to drown them in syrup. I think the addition of something sweet is definitely the superior option. I had mine with strawberries, light cream cheese and jams (St Dalfour Strawberry, Swedish Cloudberry). My brother also used honey and peanut butter. Mmm... lovely, but just a touch too fattening for my liking. BUT, if I weren't on a diet, I would have used peanut butter, jam, AND Milo. 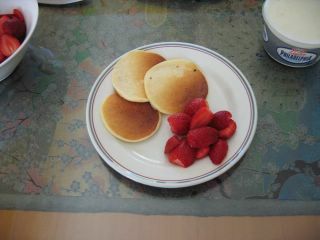 On the one hotcake. What a heavenly combination! ...but still nice. Despite their blandness, they have a lovely light texture, colour, and gorgeous smell. The perfect way to satisfy my carb-craving without inducing undue guilt and self-loathing!